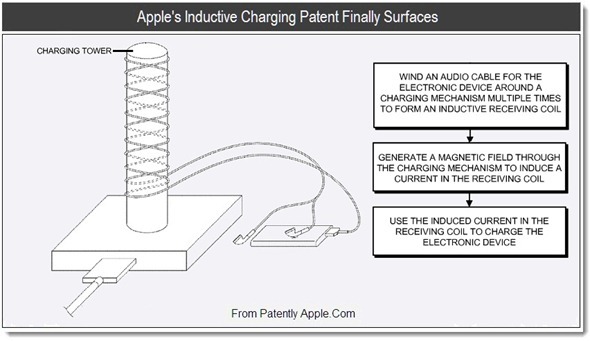 Patently Apple has brought to our attention a patent which sheds some light on Apple’s potential plans for inductive charging, comparable to the Touchstone charging hub on the market for those HP’s webOS-based devices. I say comparable, but in fact the only similarity is that your iOS device would be fed power inductively. As you can see from the diagram below, there is what is called a charging tower, on which you would wrap your earphones around, much like you would do with one of those now-rarely-sighted USB-dongle mp3 players when you want to put them in your pocket. 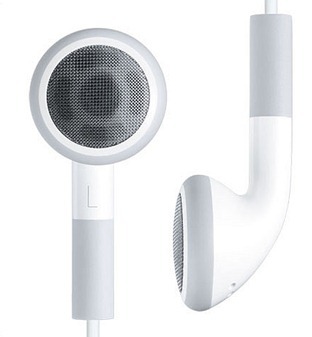 The earbuds would be fitted with a conductive metal mesh which would be placed atop the iDevice and subsequently charge it. The rather unsightly charging tower, which looks somewhat like a toilet-roll holder, would be powered by an AC adapter and convert the voltage, powering the transmitting coil which is wrapped around a ferromagnetic core. This arrangement produces varied magnetic flux in the ferromagnetic core. Potentially, the magnetic flux could transfer through air, which could theoretically accommodate a charging station bereft of a ferromagnetic core. Thus, we could see wireless charging. Charging through a magnetic field is seen as the future mode of power-up within the consumer electronics industry. The convenience of being able to charge simply by placing a device on a small mat correlates well with an industry whereby wires are becoming more and more scarce. That said, it’s hard to conceive a charging-tower-headphone system such as this Apple-patented idea ever being effective even if it did get smooth edges, an Apple logo, and a white finish, and there are a variety of reasons for this. Notably audiophiles, or those who are serious about their audio quality (or even just those who don’t like useless earbuds), tend to go with Sennheiser, Denon or other manufacturers at the higher end of the market. The fact is, a large portion don’t use Apple’s pre-packaged ear buds, due to low quality, and them not actually being versatile enough to fit into everybody’s ear. If you do want wireless charging then you can currently purchase one of the many sets on the market which cater to the problem. But it does come at a cost, not only in terms of money, but such products all require cases which bulk up the device quite significantly, reducing some of that valuable pocket-space and turning your device into a bit of brick. What’s your take on all this wireless business – necessary? Gimmick? Personally, I think that whilst toilet-roll holders are indeed essential, charging towers for wireless charging are not. At least not yet.